Imagine yourself in Fort Stockton’s adobe Grey Mule Saloon, around 1894. Sidle up to the bar and order a shot of whiskey, but keep an eye out for trouble while you imbibe. Cowboys, sodbusters, and hot-headed gunslingers—drinking, smoking, cussing, gambling, and spoiling for a fight—pack this Wild West saloon. Grey Mule Saloon is at 101 E. Callaghan St. in Fort Stockton. Hours: Wed-Sun, 1:30-7. Call 432/336-9463; www.stegenwines.com. Now, flash forward to the 21st Century. The Grey Mule Saloon—now a designated Texas Historical Landmark—has been reborn as a wine bar and tasting room for Texas’ largest winemaker, Mesa Vineyards. Today’s patrons sip reds, whites, and rosés in a refined setting you’d expect from a big-city bar. The tasting room’s vibe is relaxed and welcoming, with hardwood floors, a stainless-steel bar, high-back bar chairs, and a gray-and-tan color scheme. Adjoining rooms showcase photographs of the nearby vineyard and winery, and the shady back porch invites visitors to linger, often hosting local musicians on weekends. Mystery shrouds the Grey Mule Saloon’s origins. By some accounts, the saloon opened in the 1880s to serve U.S. Army soldiers garrisoned at Fort Stockton. A few years later, so the story goes, the infamous Pecos County Sheriff A.J. Royal and a partner acquired the Grey Mule and attempted to drive another nearby saloon out of business. When locals boycotted the Grey Mule, Royal threatened violent retaliation. In a strange twist, after losing a bid for reelection, Royal was shot dead by an assassin as he cleaned out his desk in the Pecos County Courthouse. The murder remains unsolved, and the bloodstained desk now sits across the street at the Annie Riggs Memorial Museum, a good place to learn more about the general history of Fort Stockton and the area. Despite the murky chronology of the Grey Mule’s early days, we do know that the building served as a law office, bookstore, café, and a private home before opening in November 2012 as a tasting room for Ste. Genevieve Winery and its parent company, Mesa Vineyards. In addition to wine tastings, the Grey Mule offers glasses of visitors’ favorites, sells bottles and cases of wine, and serves such simple fare as cheese and fruit plates with bread and Texas olive oil. The saloon also sells accessories like corkscrews, wine glasses, souvenir T-shirts, and wine-club membership plans for connoisseurs. In a tasting room, it’s all about the wine, and the Grey Mule’s extensive selection of reds, white, rosés, and dessert wines impressed me. In addition to the best-selling Ste. Genevieve “mother brand,” the winery produces more than a dozen different wines under the labels of Lost Maples, Shadow Brook, Peregrine Hill, and Mesa Vineyards. Partial to reds, I tried the Peregrine Hill Pinot Noir, a true Texas appellation (meaning that all of the grapes are grown in Texas). Rich with dark-berry earthiness and peppery undertones, it’s also a great value at $11 a bottle. And because I’m also a fan of Chilean and Argentinian Malbecs, I also sampled the Ste. Genevieve Malbec. One glass of this rich, rustic, and full-bodied red easily led to another, and I bought a couple of bottles to enjoy at home. As the largest of Texas’ wineries, Mesa Vineyards produces 600,000 cases of wine a year, and bottles more in a day than most Texas wineries produce in a year. Despite a 600-acre vineyard about 27 miles east of Fort Stockton, Ste. Genevieve supplements its locally grown fruit with grapes from France, Chile, California, and South Africa. Ste. Genevieve took root here in Texas’ Escondido Valley more than 30 years ago. With long sunny days, cool nights, calcium-rich topsoil, and a dependable artesian water supply, the valley provides an ideal microclimate for grape-growing. Recognizing the valley’s potential, the University of Texas system, along with French wine giant Domaine Cordier Estates, plant-ed a vineyard on university-owned land in the early 1980s. In 1984, Cordier Estates built Ste. Genevieve’s 68,000-square-foot, four-story winery, outfitting it with the best winemaking equipment available. In 2005, Mesa Vineyards, an investment group led by wine-industry veteran Pat Prendergast, purchased Ste. Genevieve and breathed new life into the company. Mesa Vineyards invested in new tanks, cooling systems, bottling lines, and other winemaking equipment; expanded the winery’s premium labels; and rejuvenated the vineyard, which is still deeply rooted in land leased from the University of Texas. 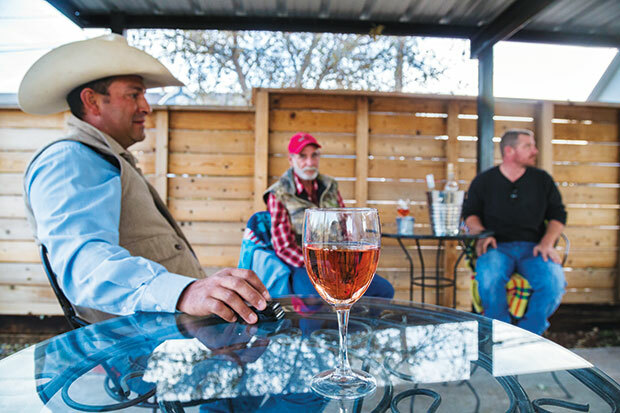 Mesa Vineyards’ dedication to producing high-quality wines has borne fruit, and you can now sample the winery’s premium varietals and blends at the Grey Mule Saloon, in the heart of Fort Stockton’s historic district.